ONE: Take the first hour off. Getting the day started, and getting to school, can be a nightmare for those with ADHD. The organizational and attention requirements - getting up, eating, getting dressed, do I have everything? getting to the bus stop or driving, or getting in the car, do I have everything? collecting books, papers, notebooks, lunch, money, do I have everything? getting through the crowds of kids, the hallways, the lighting, finding my locker, do I have everything? getting to class... by the time the ADHD student gets to that first period class they are already worn to a frazzle by the assaults of the morning. Make them uncomfortable now by forcing them to sit still and listen, and you will lose them for the day. Make that first hour a simple "chill out" time. Put no demands on it outside of basic safety. That will let the student relax, and make the rest of the school day possible. TWO: Wear a ballcap. Yes. 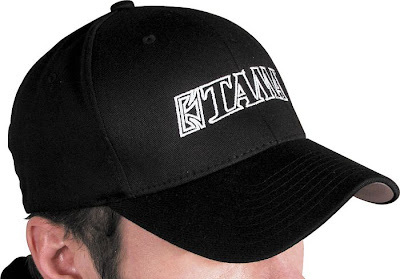 A cap with a bill at the front - preferably a very curved bill - keeps the fluorescent lights out of the eyes and acts as a kind of "blinder" - minimizing visual distractions. This simple - very low-tech solution - can make a massive difference. Note, seems to work best if the underside of the bill is a dark color. THREE: Carry a mobile phone. OK, if I haven't threatened your basic school administrator enough with the last thought, here we go! The mobile phone, with reminders and prompts either set into the phone's alarms feature or delivered from Google Calendar by text message, can keep the student on task in un-matched ways. It can also be used as a watch (without that disturbing thing on your wrist), as a verbal notetaker. And to confirm - via text message to parents and/or teachers, task completion. FOUR: Make chairs and desks optional. Why force discomfort? If a student is uncomfortable the bulk of their cognitive capabilities become devoted to that discomfort, leaving precious little for knowledge processing. Who cares if they sit on the floor, or by the window, or stand in the back. You can surely negotiate limits, but be fair. After all, plenty of high-paid executives walk around as they work - sitting in a chair for hours on end is NOT career related. FIVE: Allow escape. Have an escape plan. What does the student do if he/she needs to "get out"? I've negotiated various things for students. With one kid there was a tree outside that could be seen from the office. Another could go sit on the gym bleachers. For a third, the library was an option. In another case the boy just needed the time to walk down the corridor, get a drink, and come back. Whatever. Forcing them to stay when they cannot is insisting on behavioral issues, and thus becomes child abuse. Plus, if kids know that they can leave - that alone creates comfort - and usually means they will have less of a need to leave. SEVEN: Don't give extra-time on tests. Attention is a problem and you want me to spend twice as much time taking your stupid test?! How ridiculous. Instead, use literacy technology (see above) to enhance reading (WYNN and read-and-Write are great for this, but even Microsoft Reader will do) and break the test up into smaller segments. EIGHT: Don't insist on homework right after school. This is horrible. After a school day what these kids need most is something completely different, totally disconnected. Give them free hours, and negotiate a slightly flexible "return to work" time. So simple. So hard to get across. If only more people would start getting it!!! The woman who runs this site suggests a before bedtime routine to make getting out of the house easier in the morning. She suggests making a list of things to do before bed such as put your purse, backpack or brief case together. Check your calendar. Lay out your clothes. Doing this every night and making it a habit in your life will make your morning routine much easier, making it easier to get out of the door in the morning. I really enjoyed reading this. Thanks for sharing it. I think these suggestions will help me a lot. Great stuff. Note, though, that all of this stuff applies universally to one degree or another. For instance: Shorter tests would work better for everybody. If I'd had anywhere near this level of awareness from school administrators back in the day, I wouldn't have dropped out. As someone with an ASD, I can tell you this would work for a lot of kids on the spectrum too. Except for maybe the shorter tests. At least for me, the break in attention would be disconcerting.